Did Miranda have enough money to retire, or not? She’d read recently of a 91-year old woman who was still working. Miranda knew that the happiest people were those who loved their work and who kept working. When people retired, she had observed, they often declined rapidly–mentally, physically and emotionally. Like her father, who fell into an alcoholic depression. 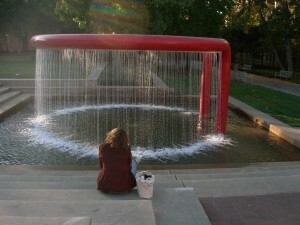 The Hoop, outside Green Library, Stanford….